Headquartered in Germany, SOWITEC is a leading sustainable energy developer with around 60 wind and solar projects totalling more than 2,600 MW across the globe. By investing in SOWITEC, Vestas enhances the company's ability to offer full-scope sustainable energy solutions by tapping into SOWITEC’s proven offering within development services. Juan Araluce, Vestas’ Chief Sales Officer, says: “With the acquisition of a minority stake in Sowitec, Vestas gains access to an independent development entity that strengthens our co-development portfolio and improves our solutions and capabilities in strategic markets in Latin America. Vestas is continuing to invest in solutions and capabilities that increase our ability to meet our customers’ evolving needs and to partner with them through the energy transition”. Frank Hummel, SOWITEC Chief Executive Officer, says: “We are proud to have Vestas as a strategic partner that further strengthens our equity and helps us to go further in the value chain. Together with our strong track record in emerging markets and our vast experience in developing utility-scale renewable energy projects, this partnership will help SOWITEC grow faster and give us the chance to profit from Vestas’ worldwide experience and presence”. Based on SOWITEC’s proven track record within solar PV project development, the acquisition also strengthens Vestas’ offering within hybrid power plant solutions. 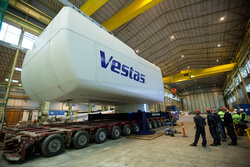 With sustainable energy’s share of the energy mix set to grow from around 10 percent today to more than 30 percent by 2035, hybrids are a key part of Vestas’ objective to develop sustainable energy solutions with wind at their core. As such, hybrids are emerging as a grid-friendly and cost-effective solution that can store and release renewable energy into the grid when needed, and hereby increase the penetration of onshore wind.